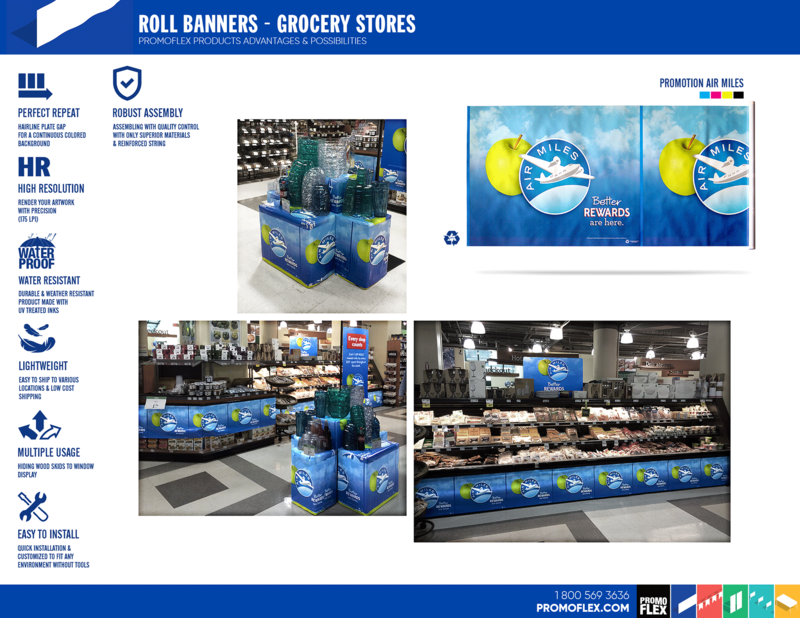 Available in all material types, our Roll Banners can be printed flat tint or in color, depending on your needs. 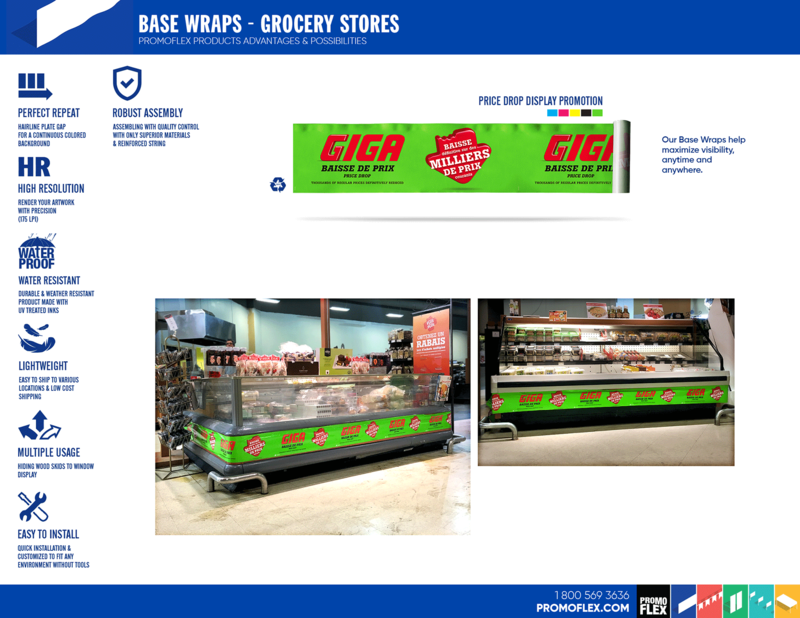 Each standard Roll Banner is printed with perfect registration for a continuous colored background and shipped without central banner core. 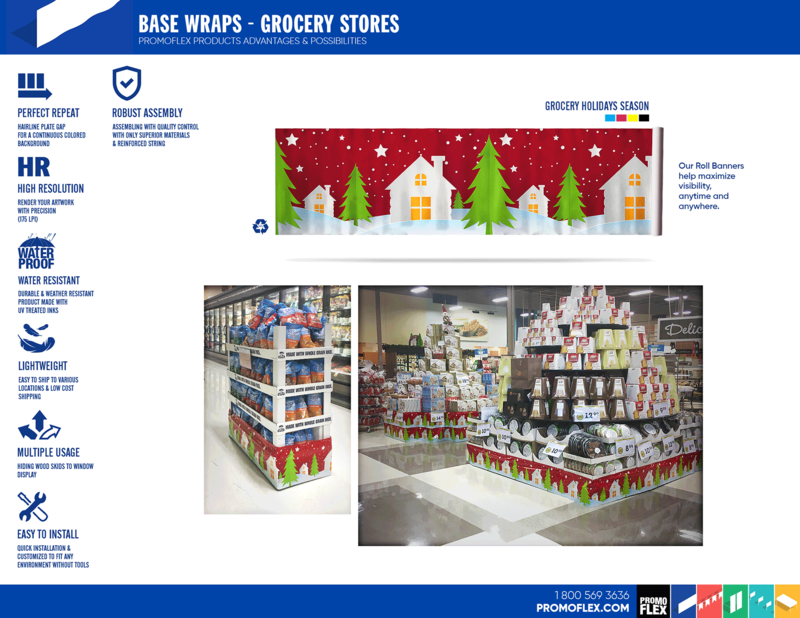 The base wrap is wet floor proof product. 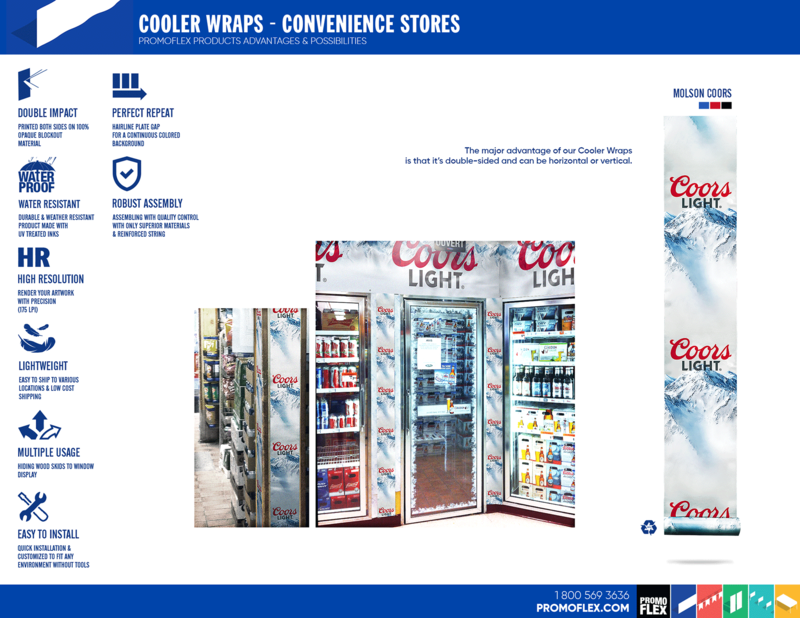 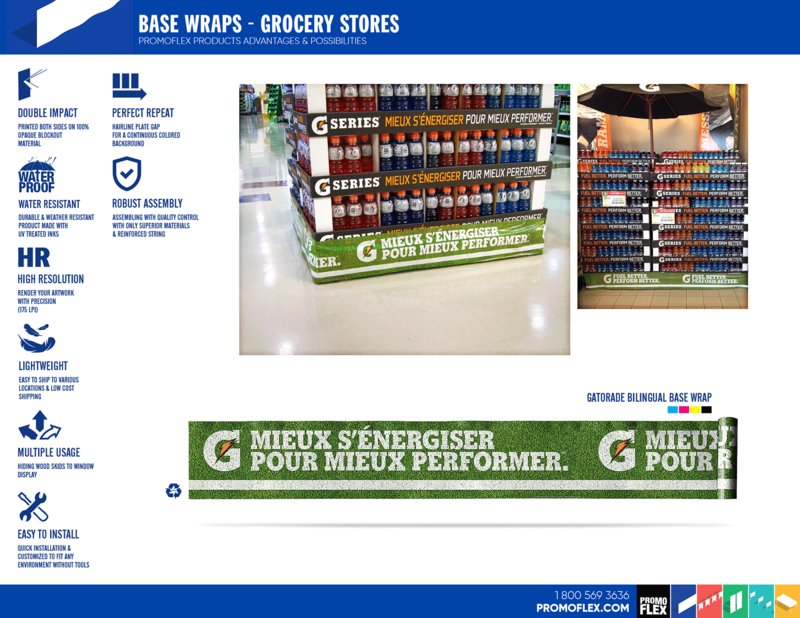 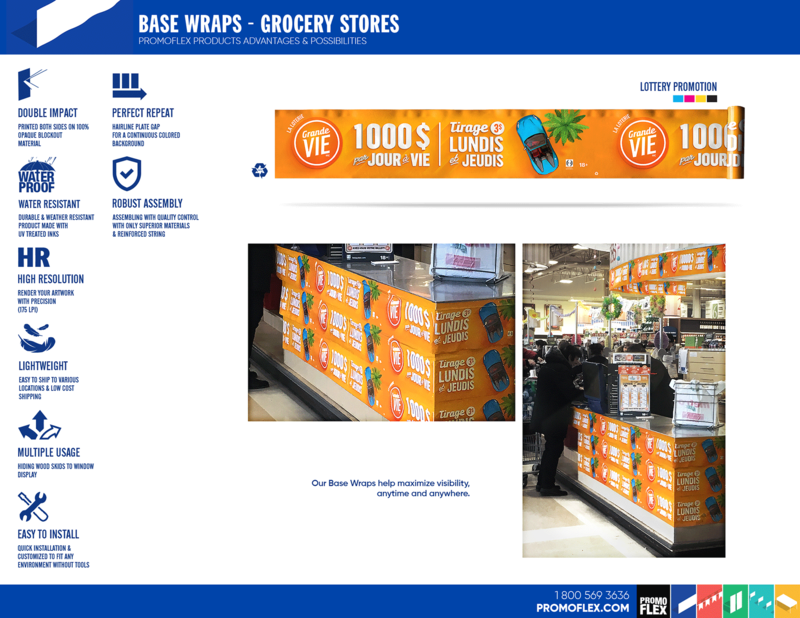 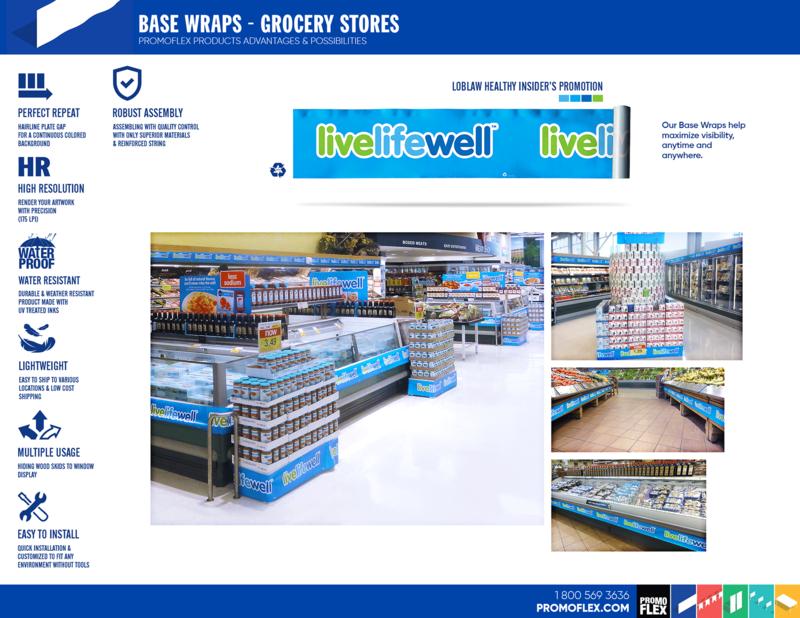 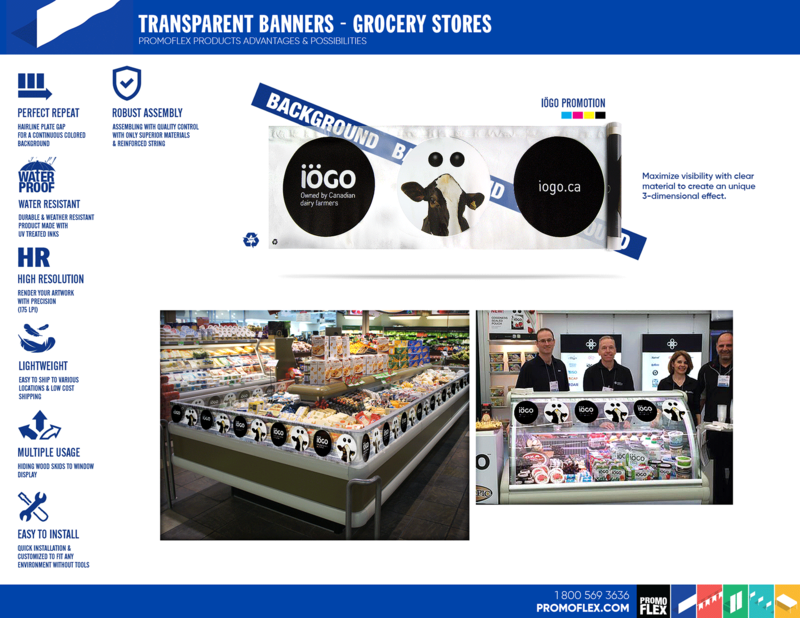 Cooler Wrap is available in the horizontal or vertical format. 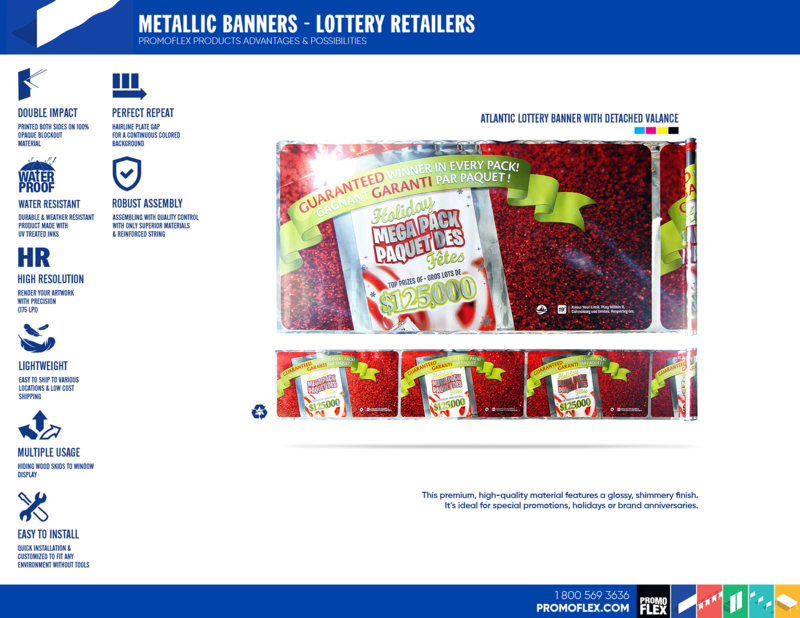 This premium, high-quality material features a gloss, shimmery finish. 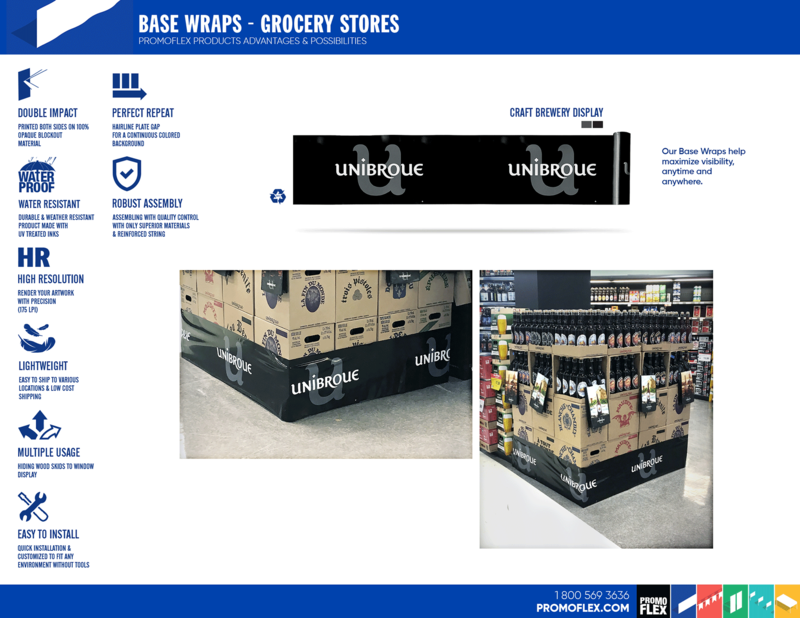 Clear product to create an unique 3-dimensional effect. 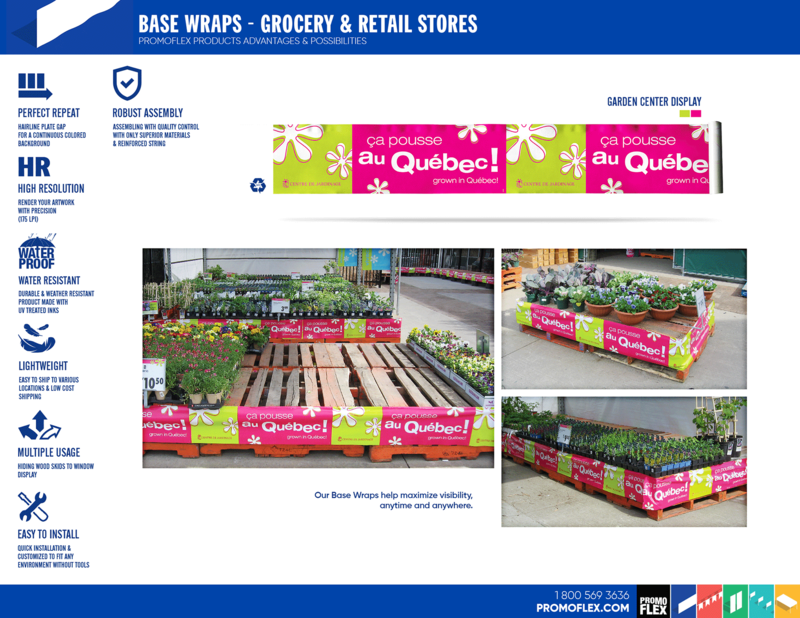 This product is available with durable and entirely customisable attachment. 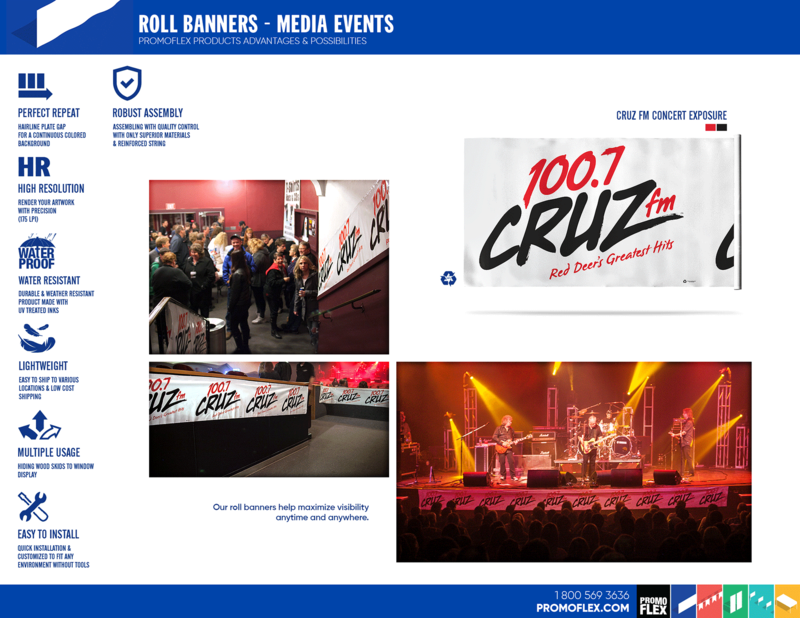 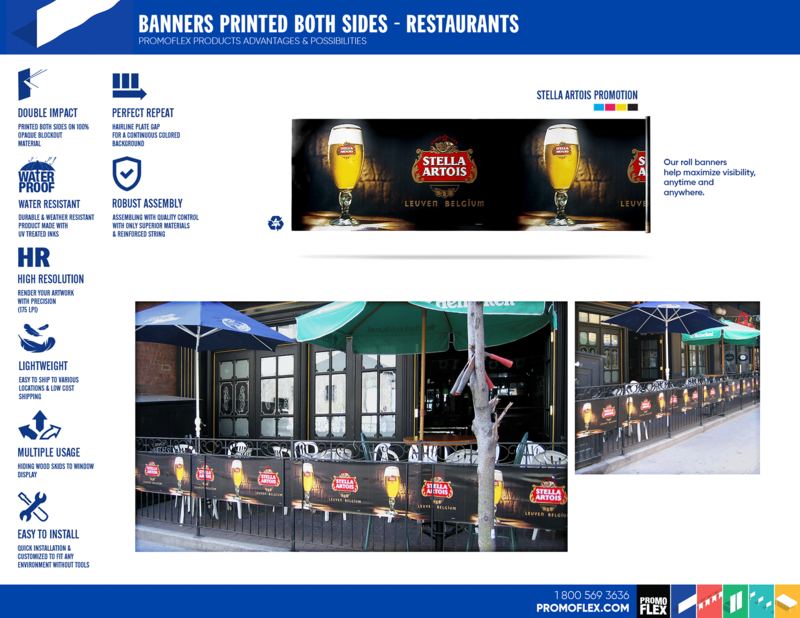 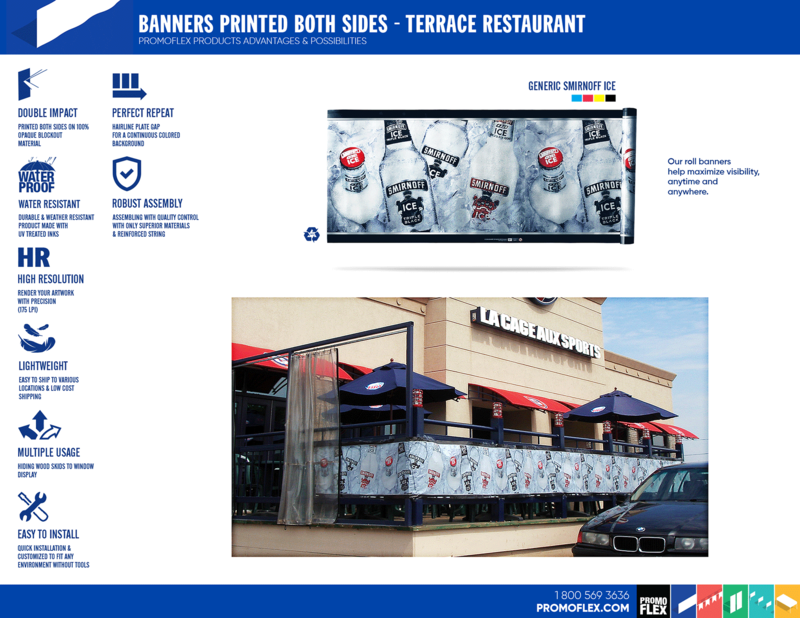 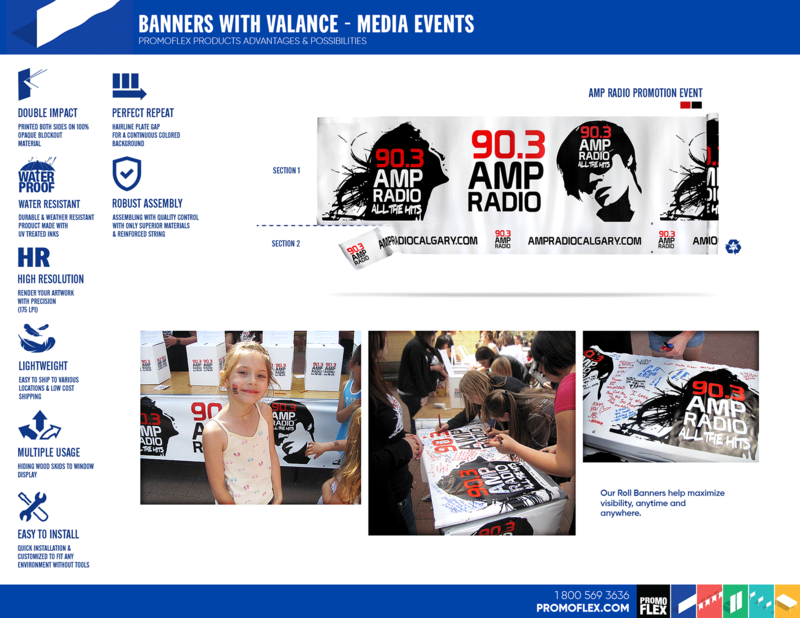 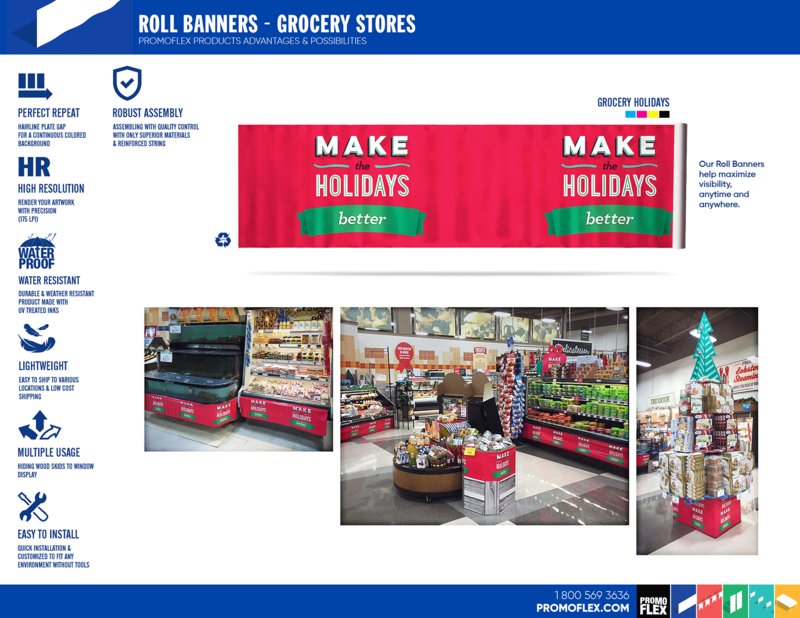 Delivered ready-to-use, our Roll Banners are created to maximize visibility anywhere, anytime with a minimum effort. 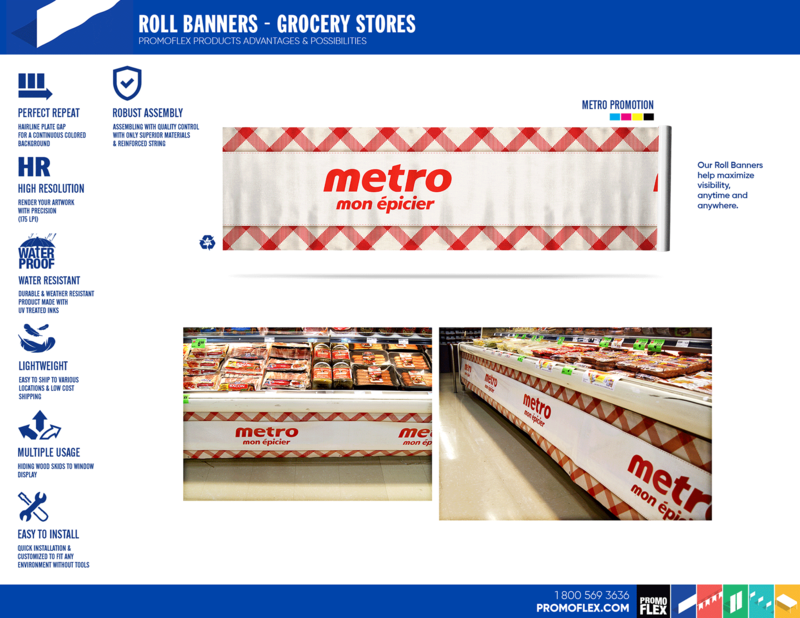 The high quality and robust Roll Banner is easy-to-use everywhere, in both indoor and outdoor settings. 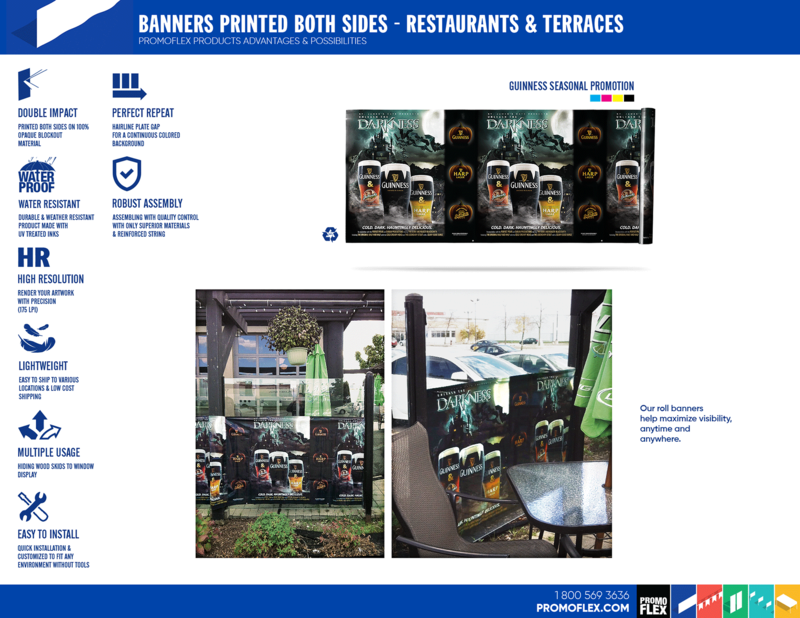 It is double-sided, environmentally friendly and features low cost shipping options. 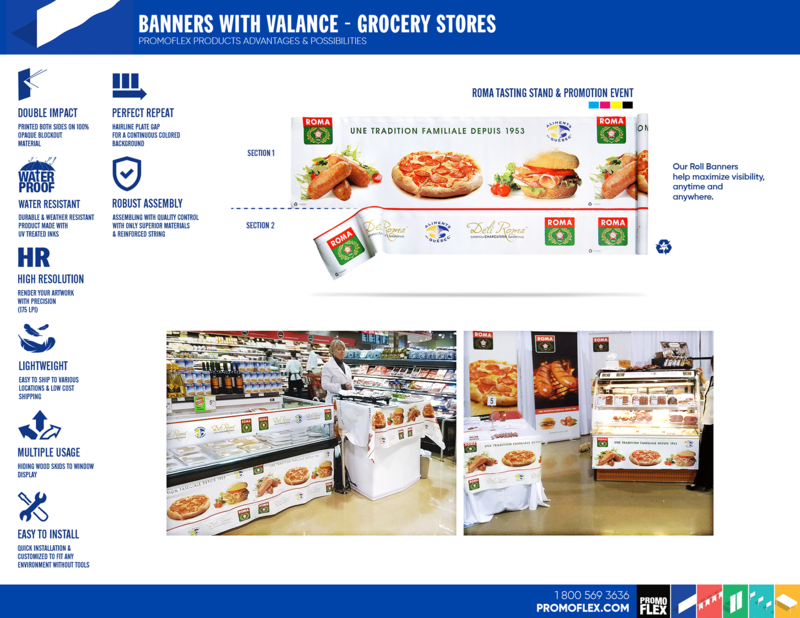 Roll Banners are frequently used by customers who want maximum impact and exposure of their products and services. 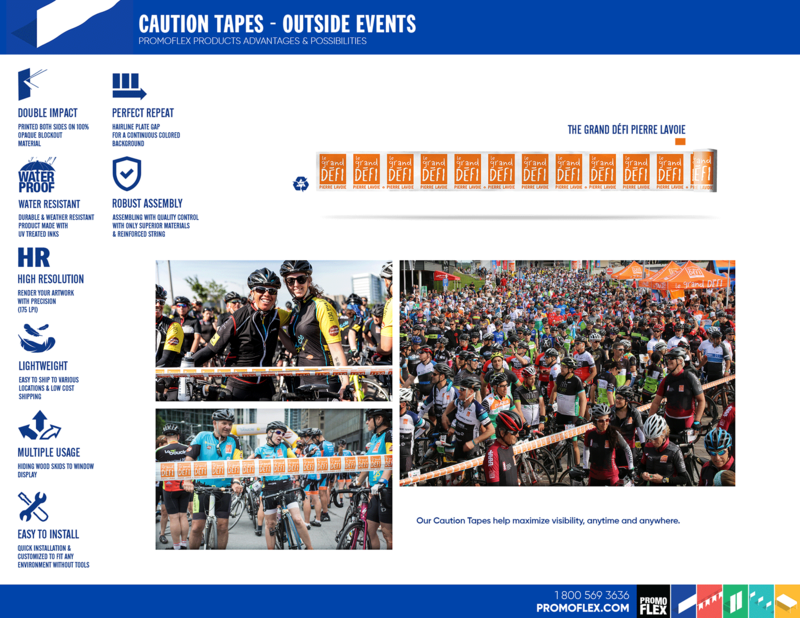 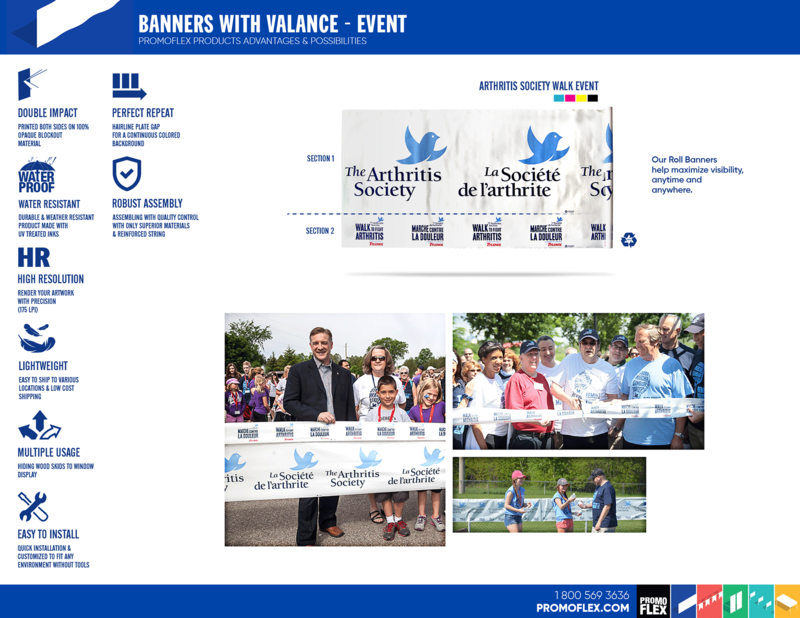 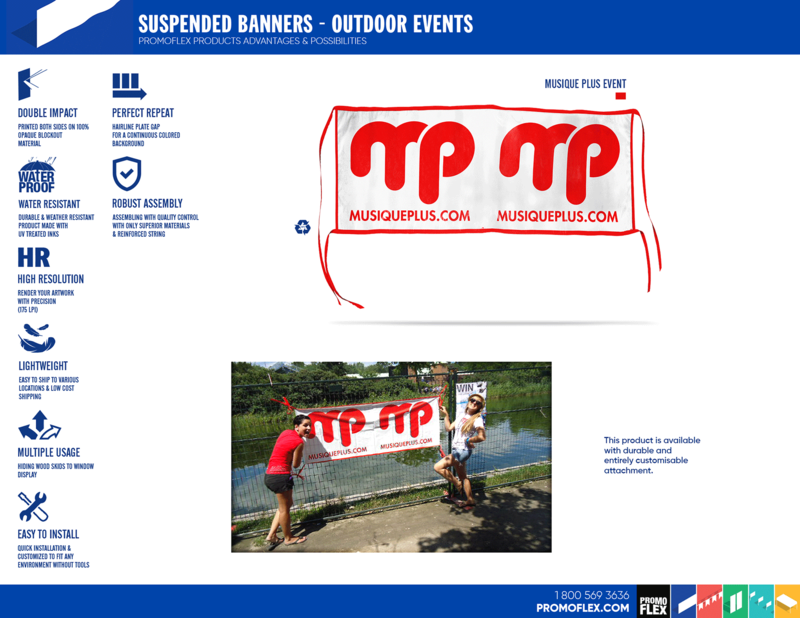 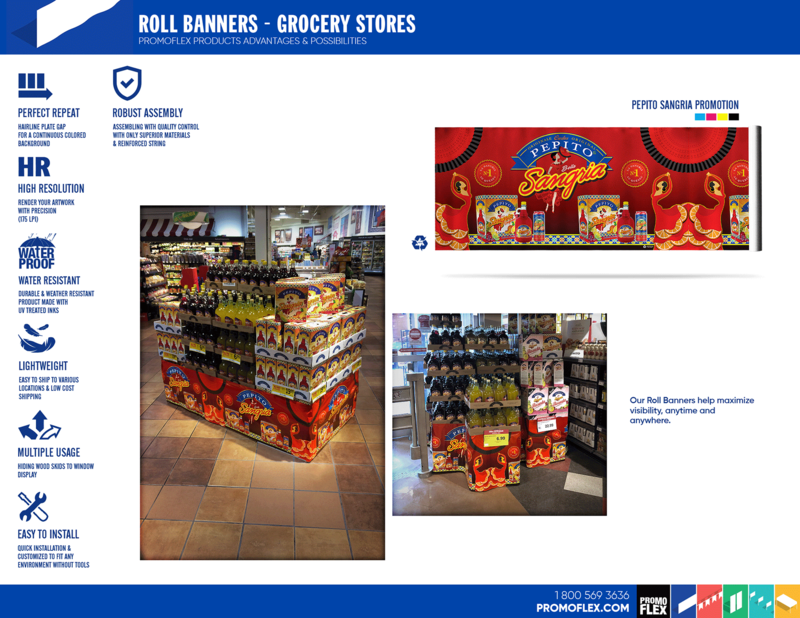 You’ll frequently see our Roll Banners at festivals, sporting events and grocery stores. 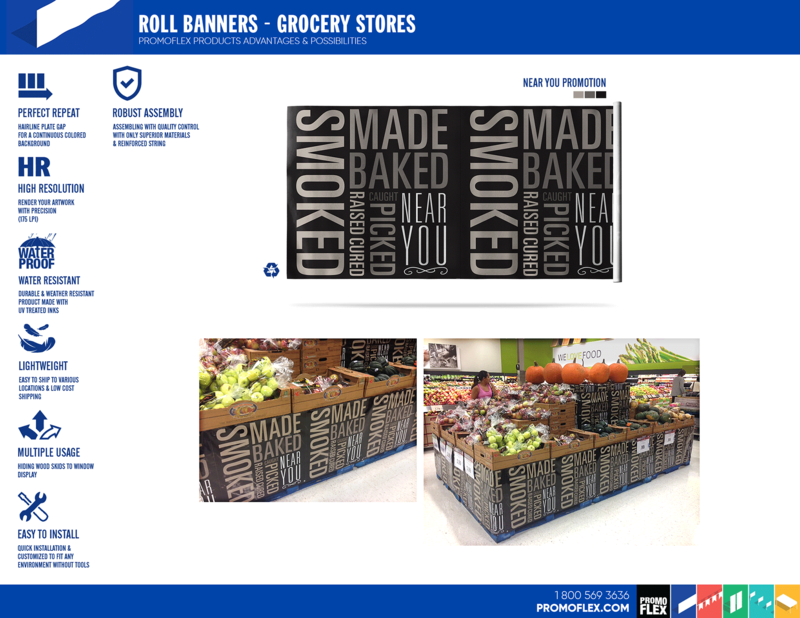 Roll Banners are delivered in easy-to-carry bags with identification. 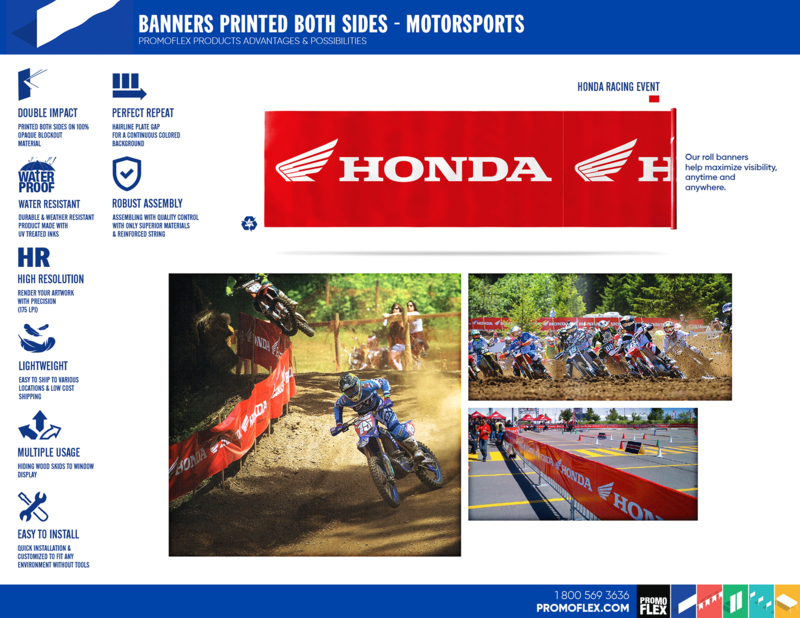 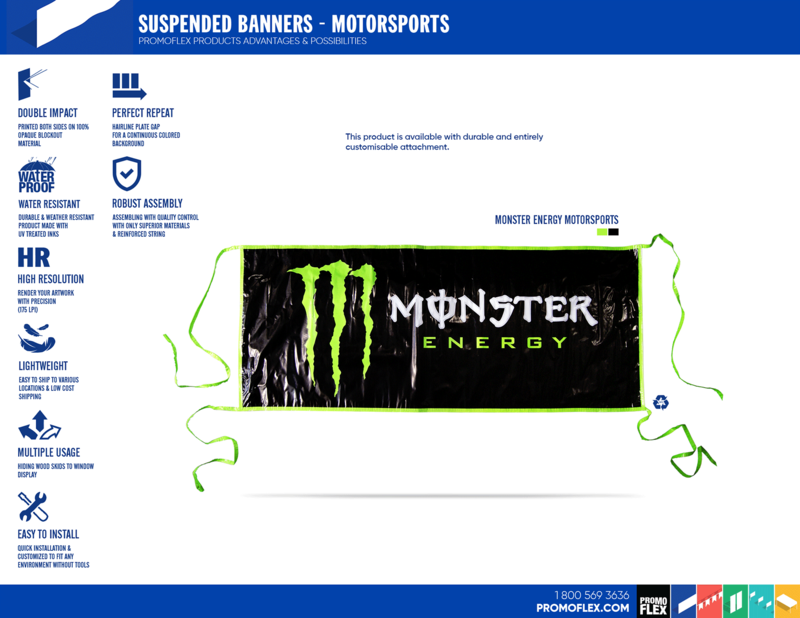 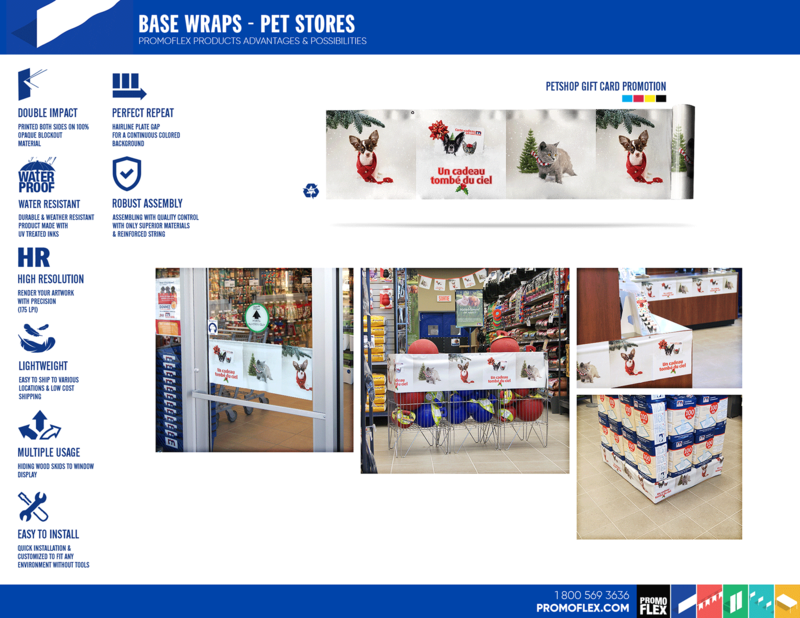 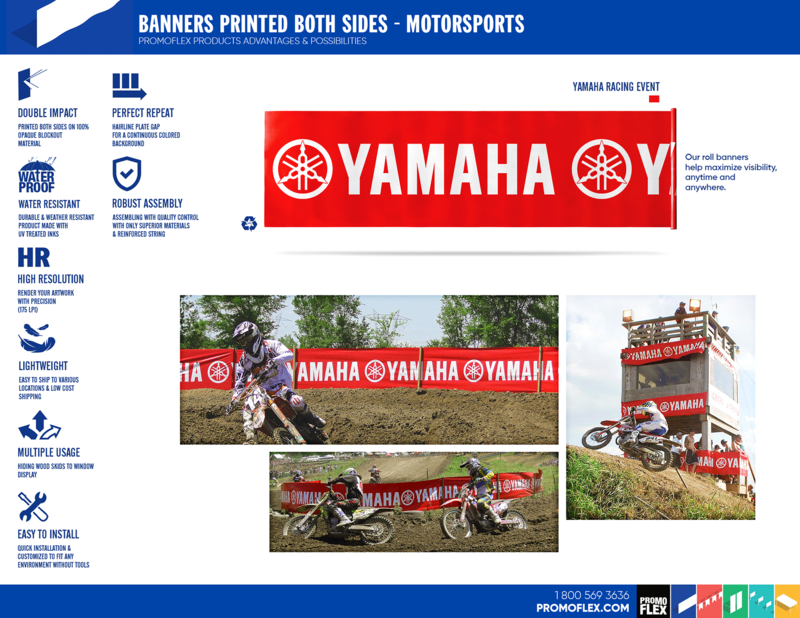 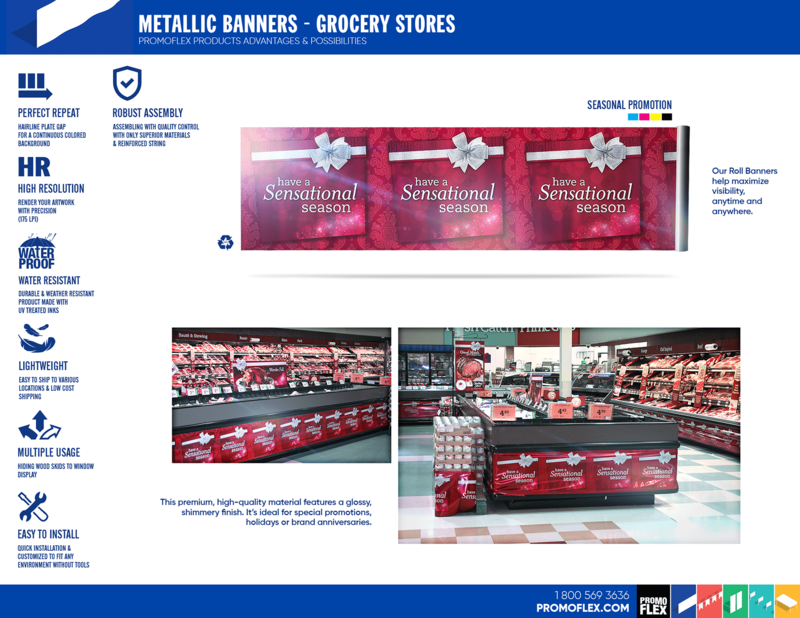 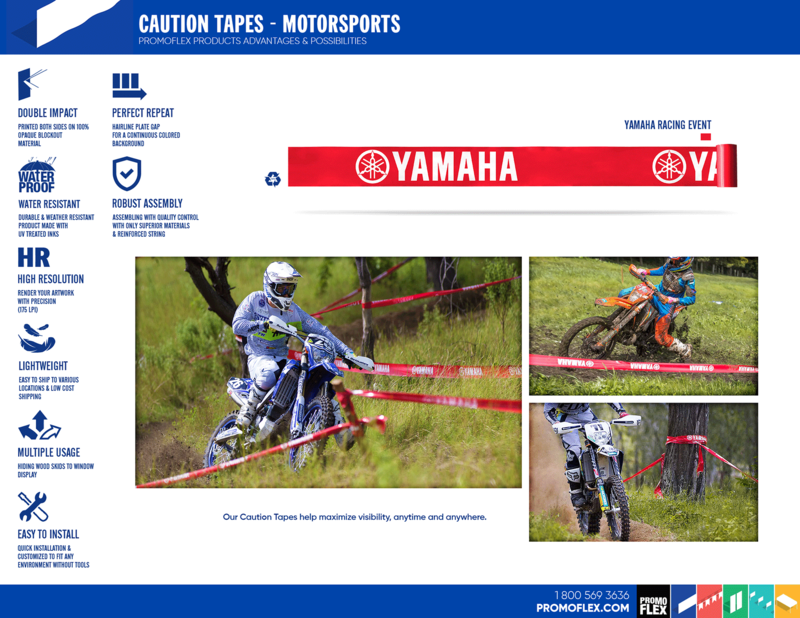 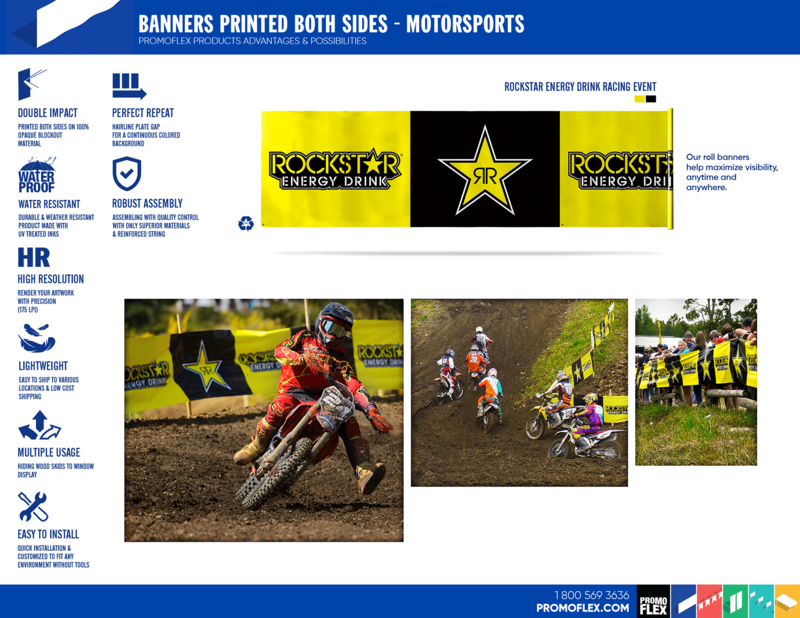 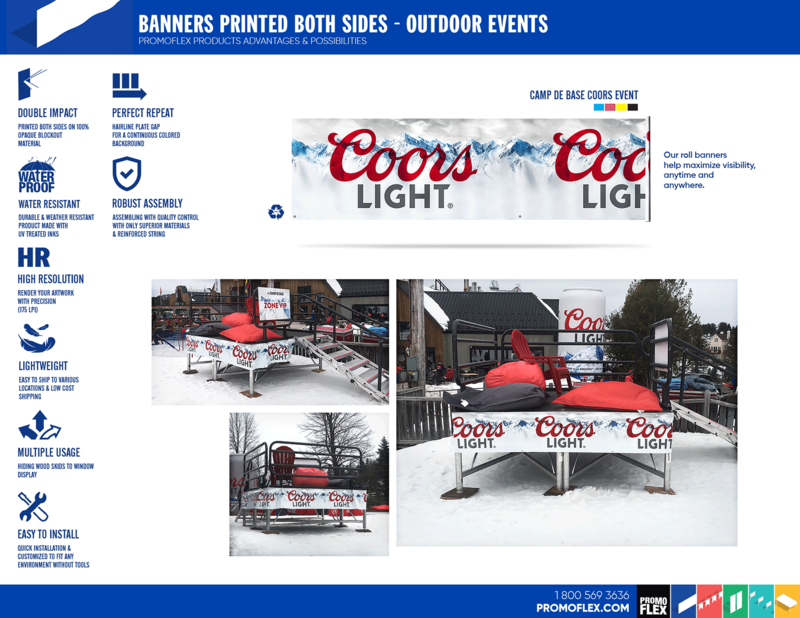 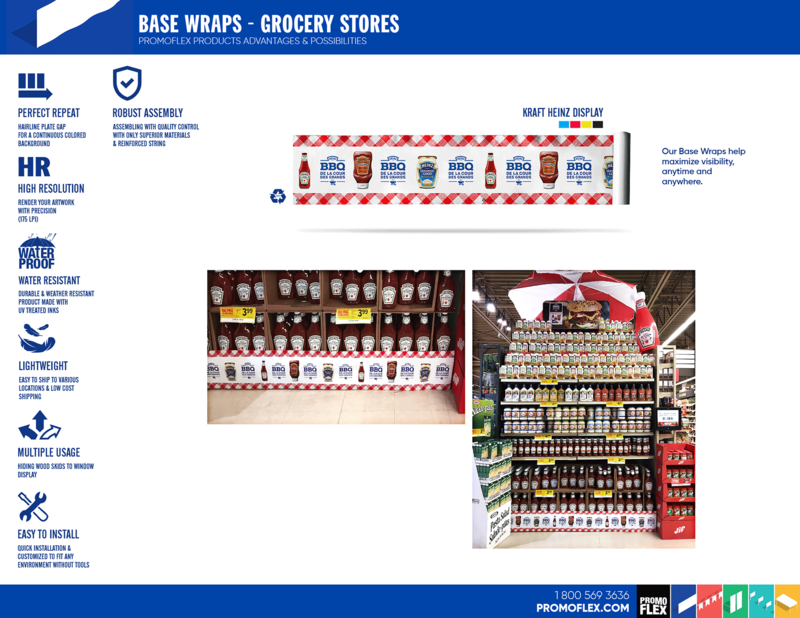 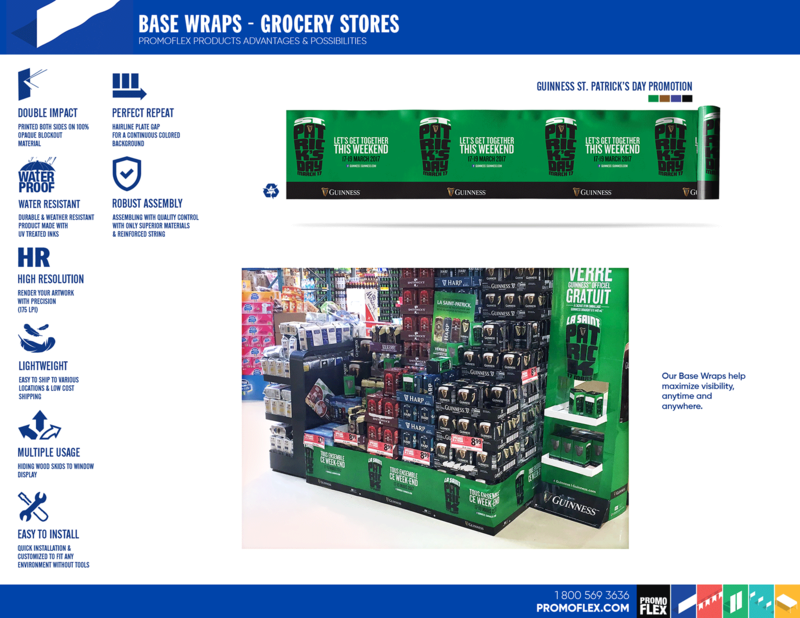 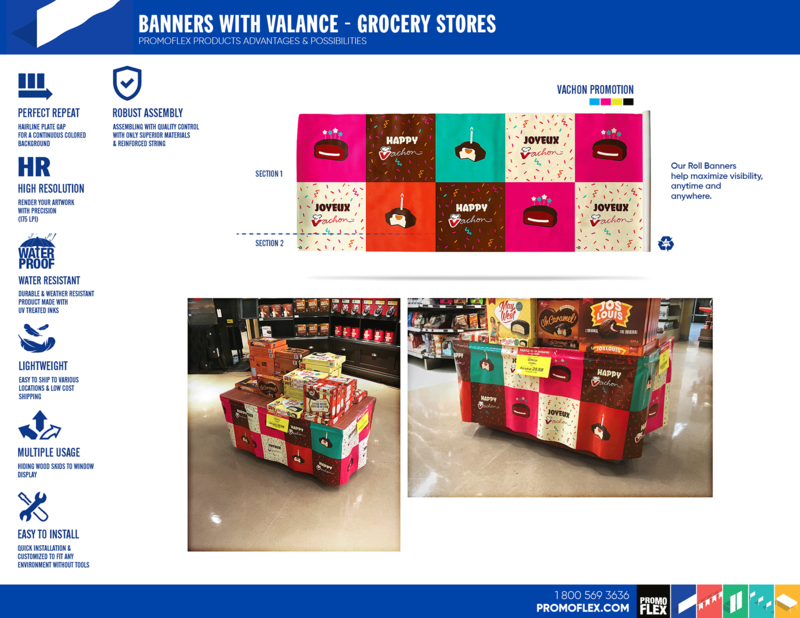 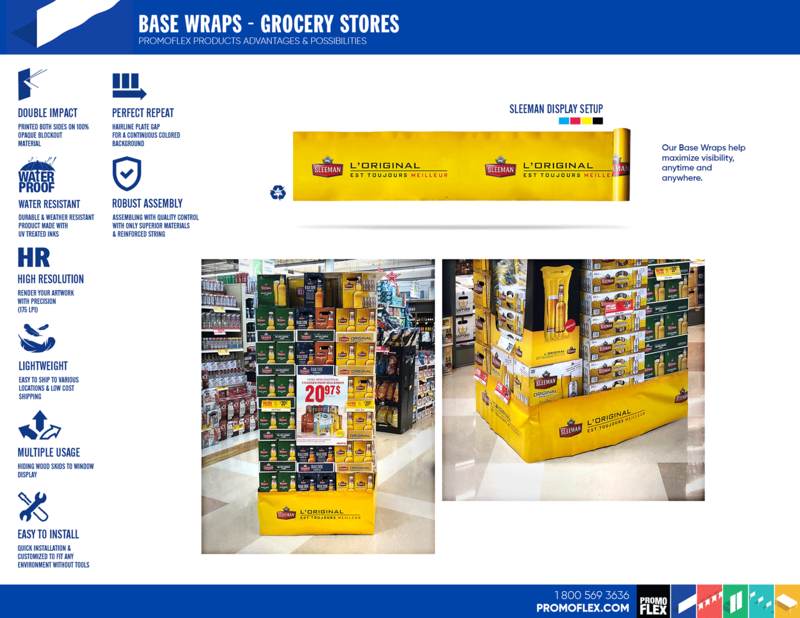 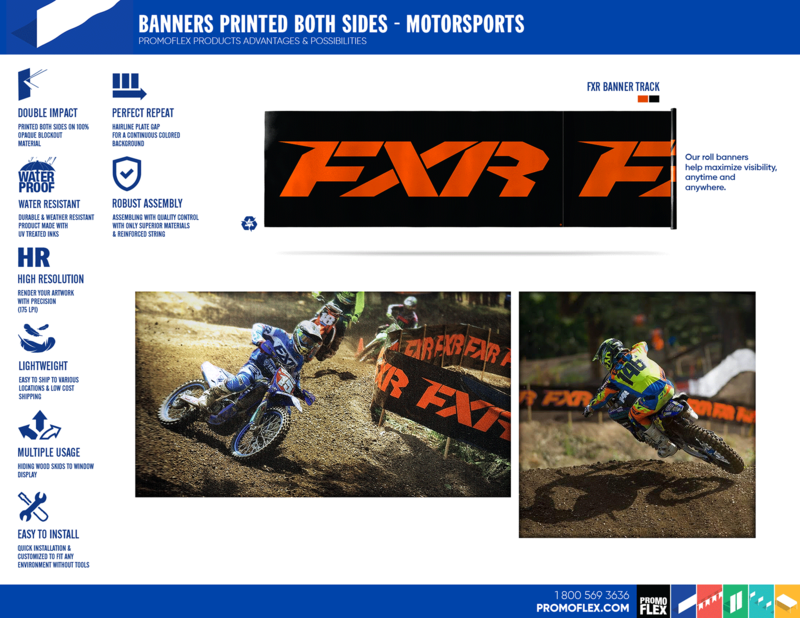 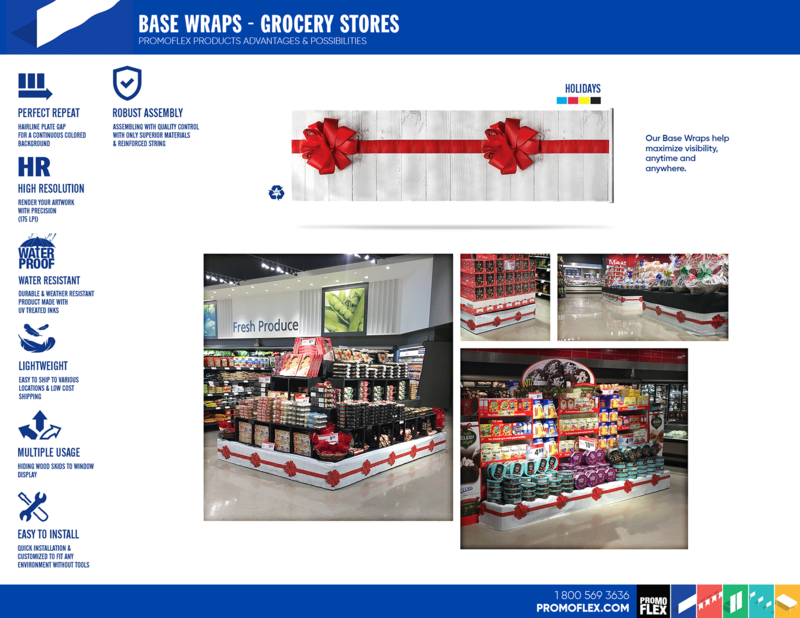 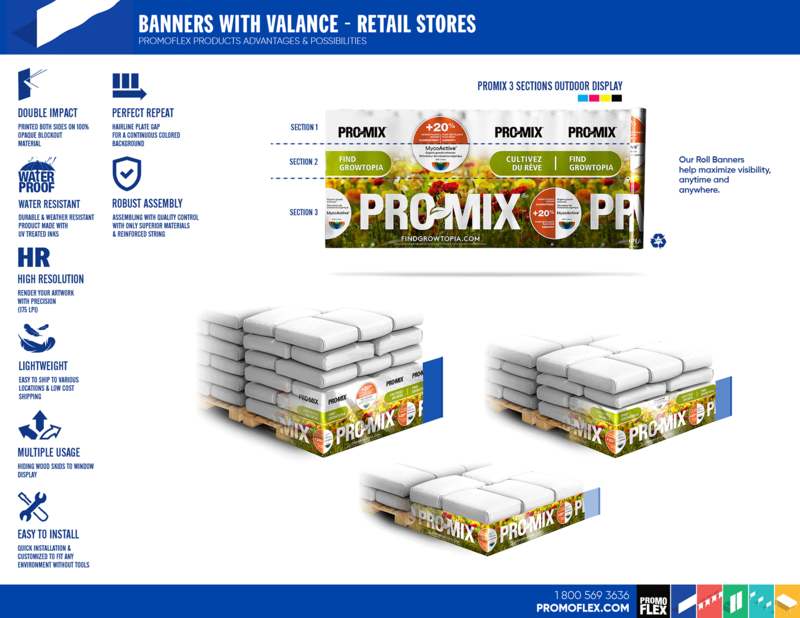 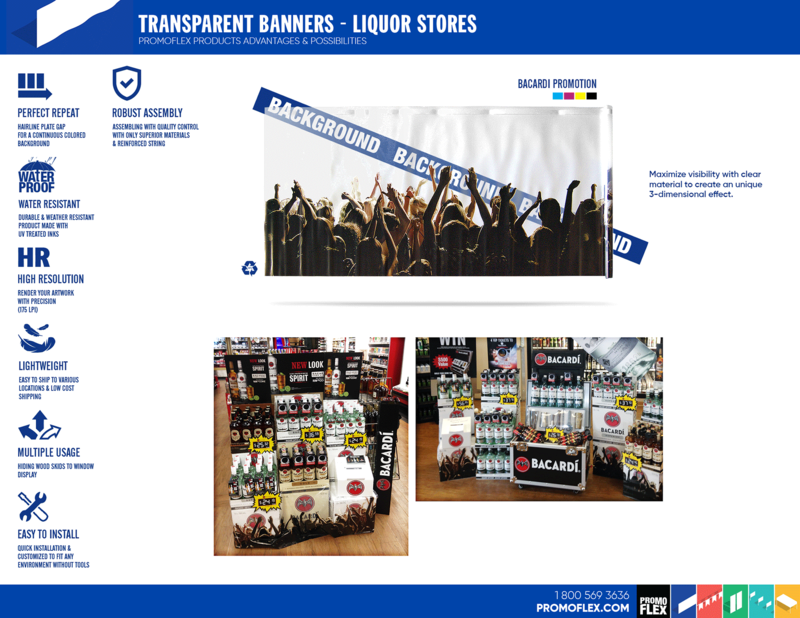 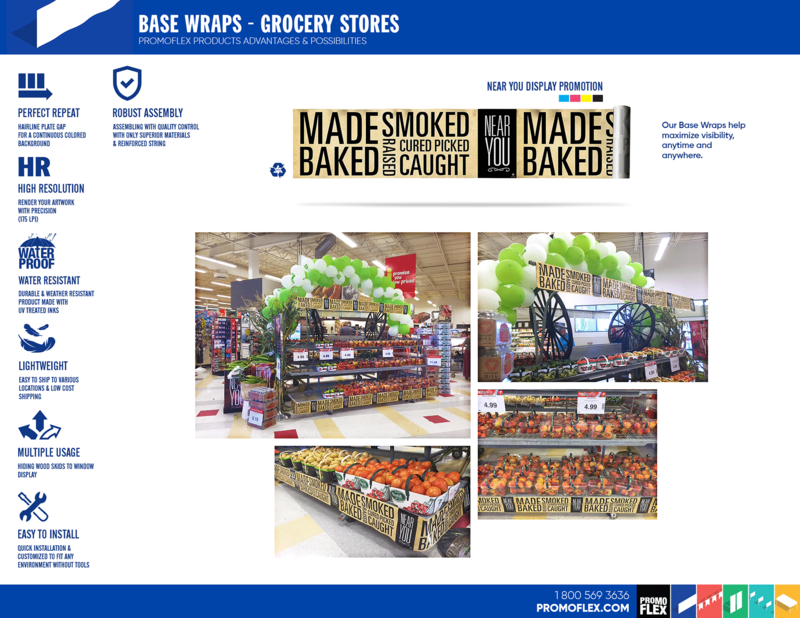 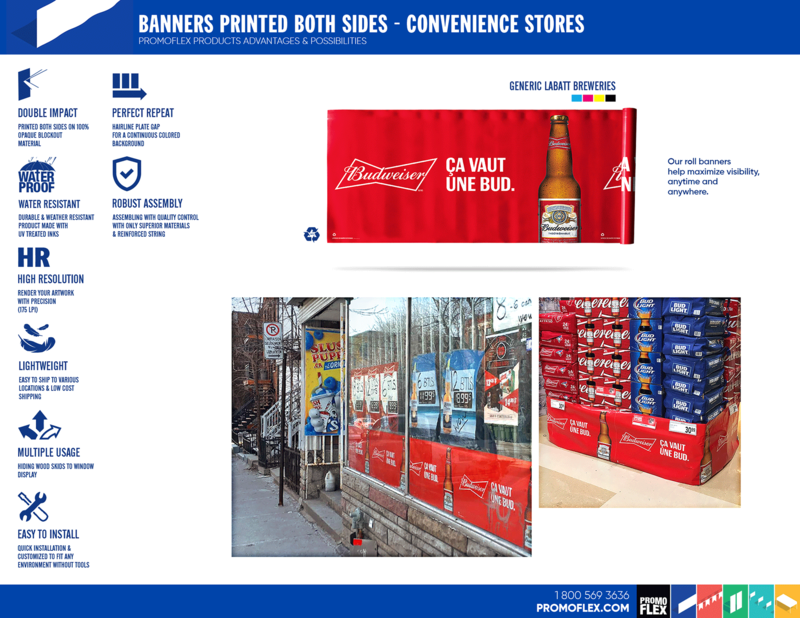 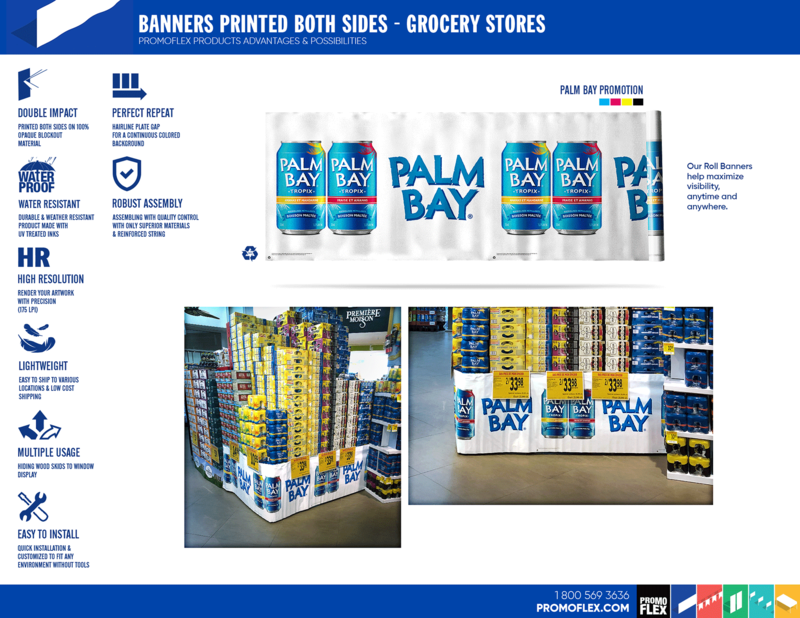 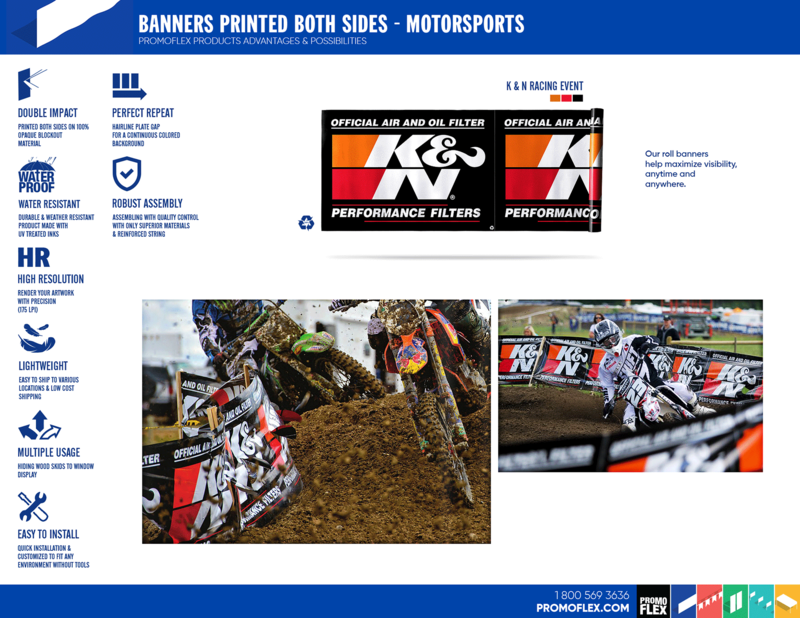 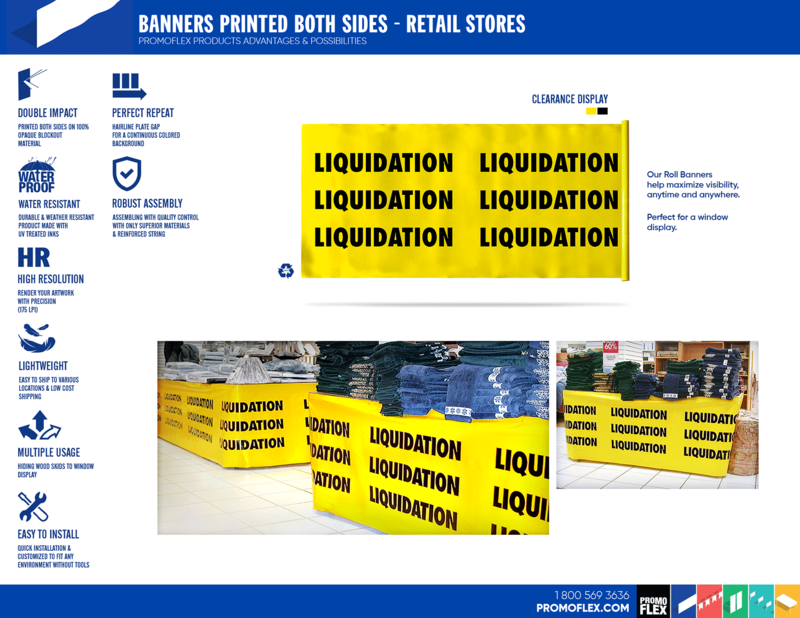 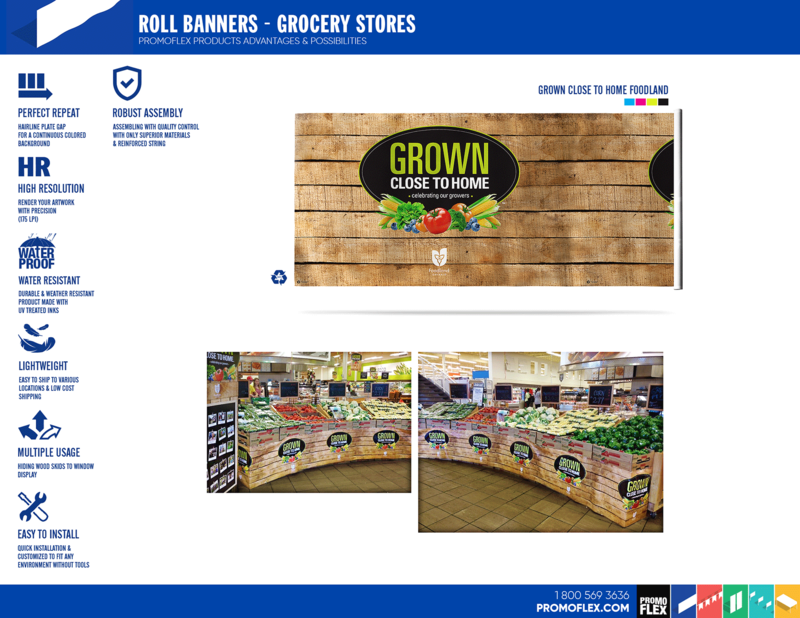 All sizes are available, from large Roll Banners (to hide racing fences), medium Banners (such as Counter Wraps for commercial counter display) or small Banners (such as Pallet Wraps or Skid Wraps to hide wooden pallet display from center aisles). 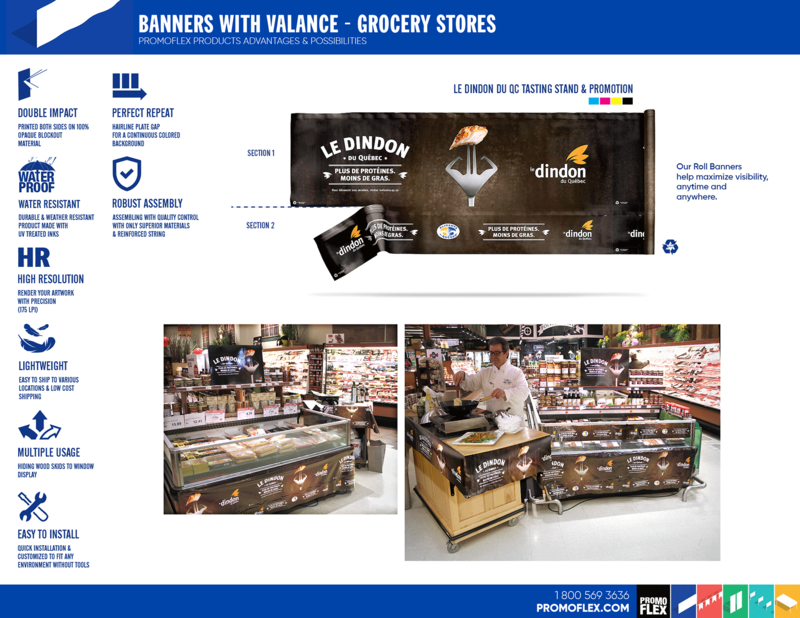 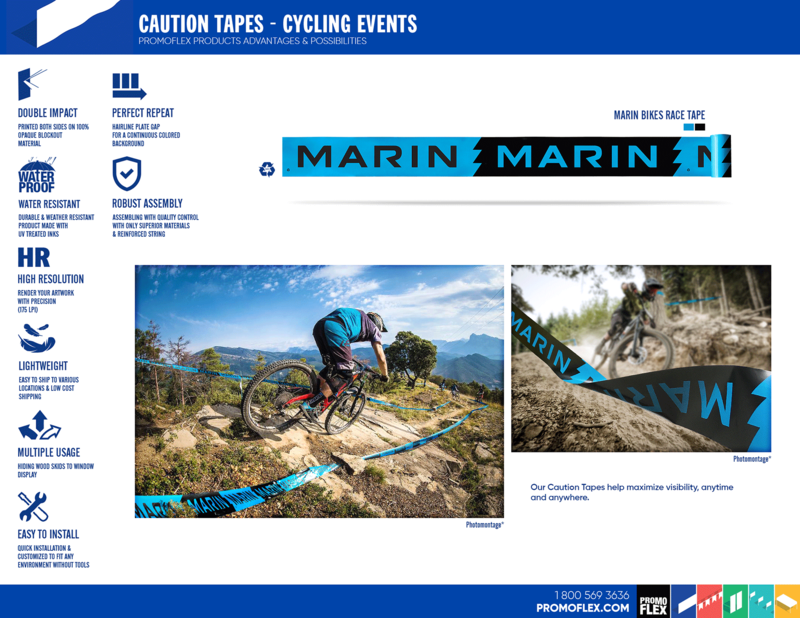 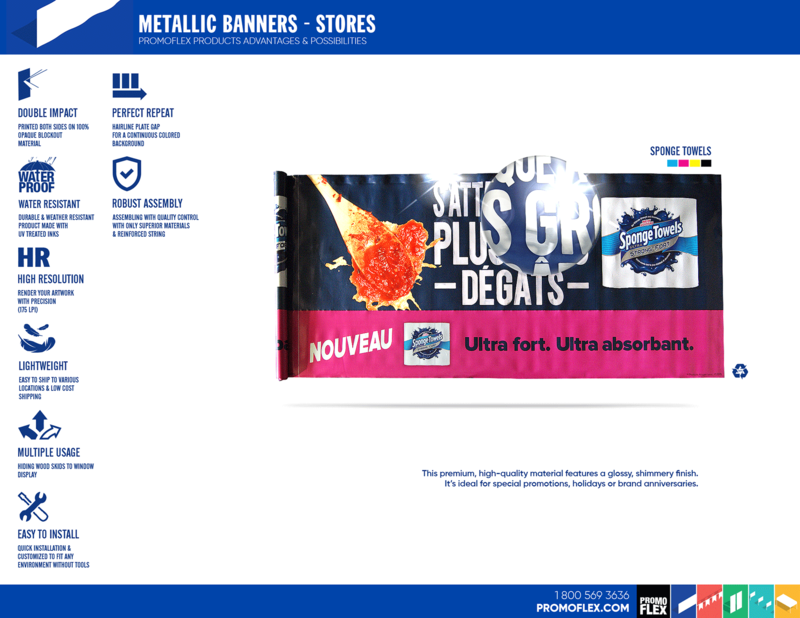 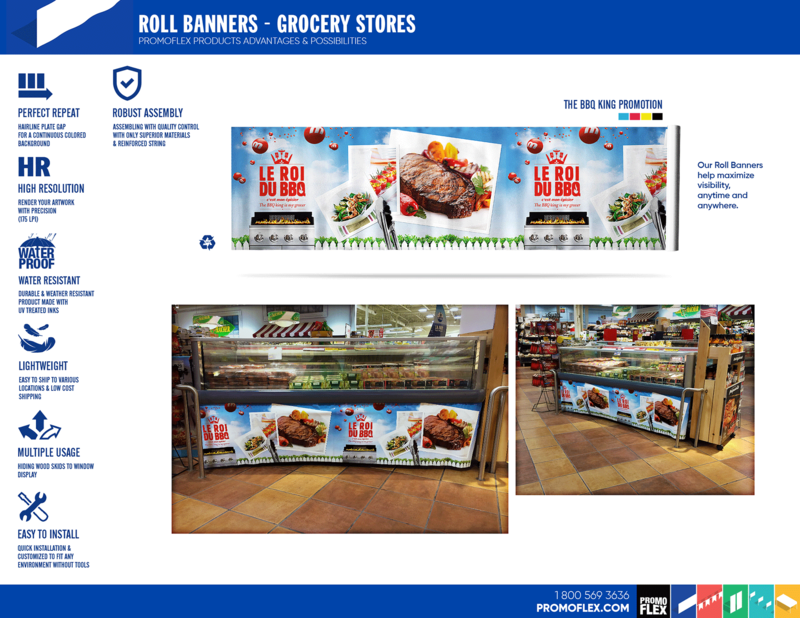 The main industries that use Roll Banners are: groceries, convenience stores, breweries, distribution companies, restaurants, banks, sports teams and the racing industry. 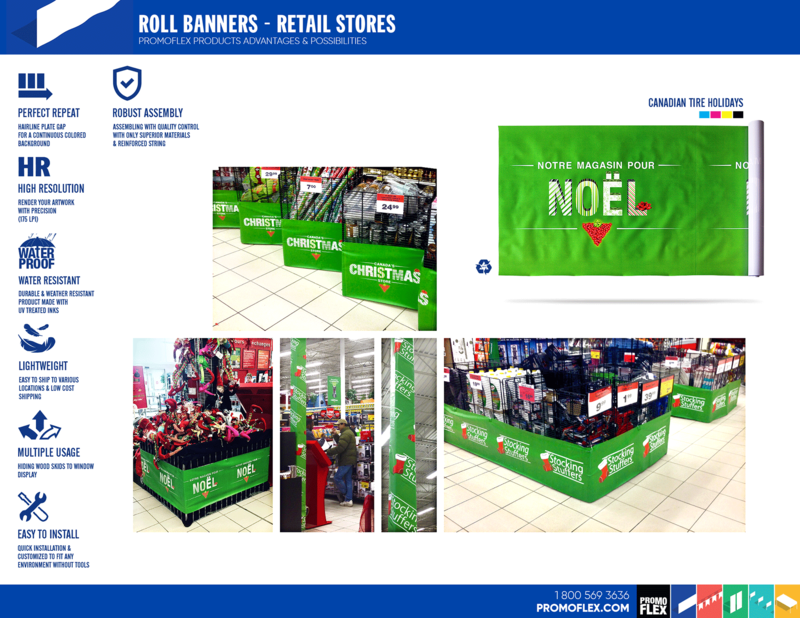 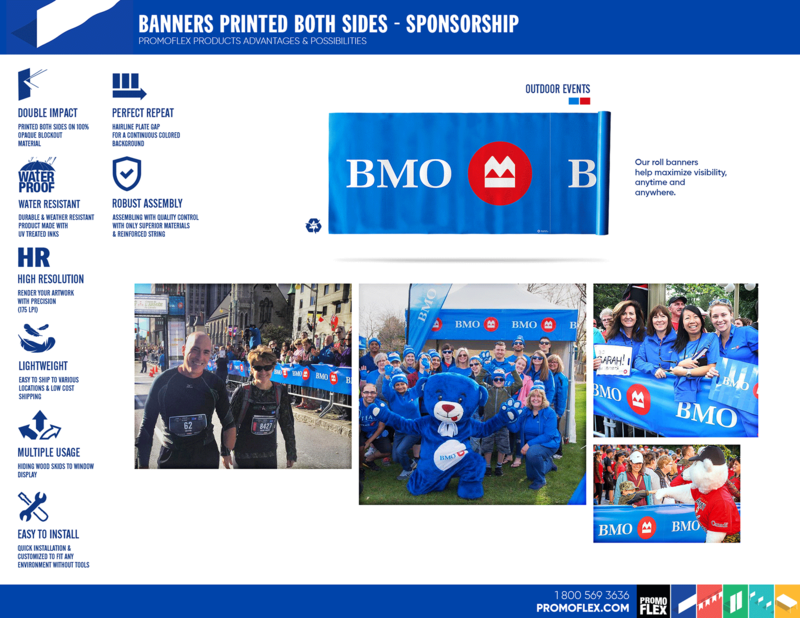 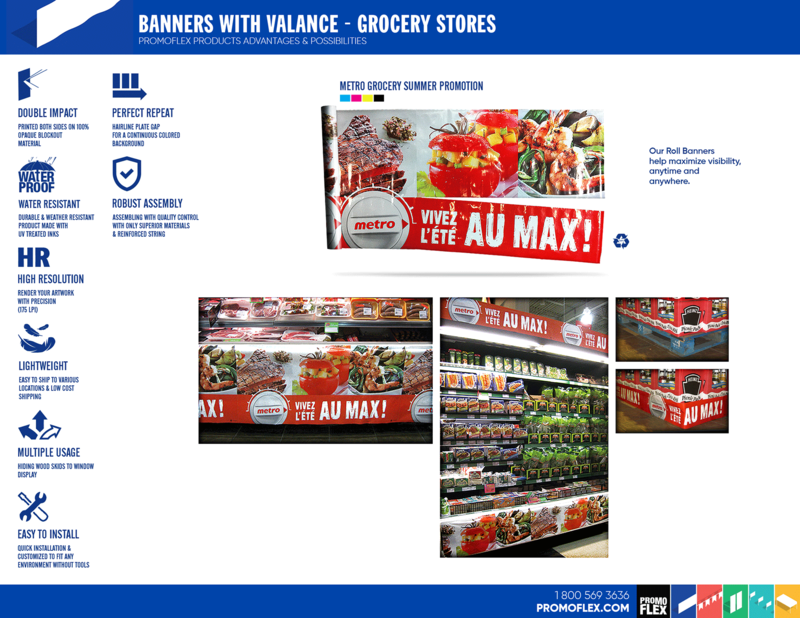 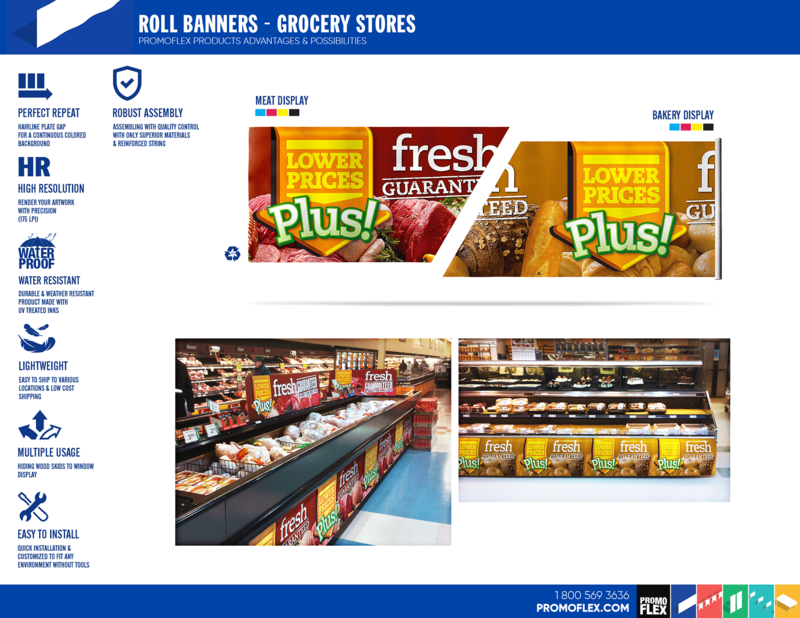 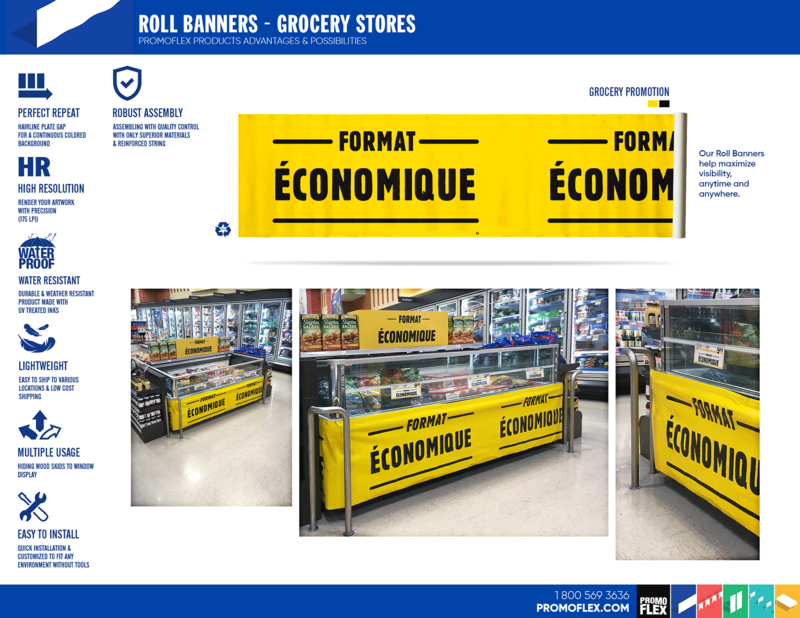 Promoflex Roll Banners are unique with the multifunctional option of adding attached or detached Valance for multiple display solutions. 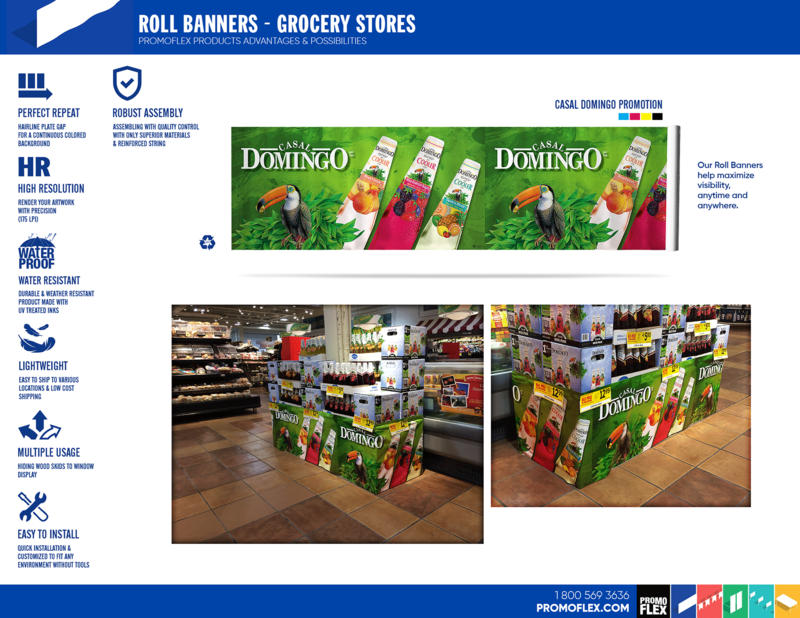 The Roll Banners can be grouped with String Pennants and Tablecloths to optimize your investment. 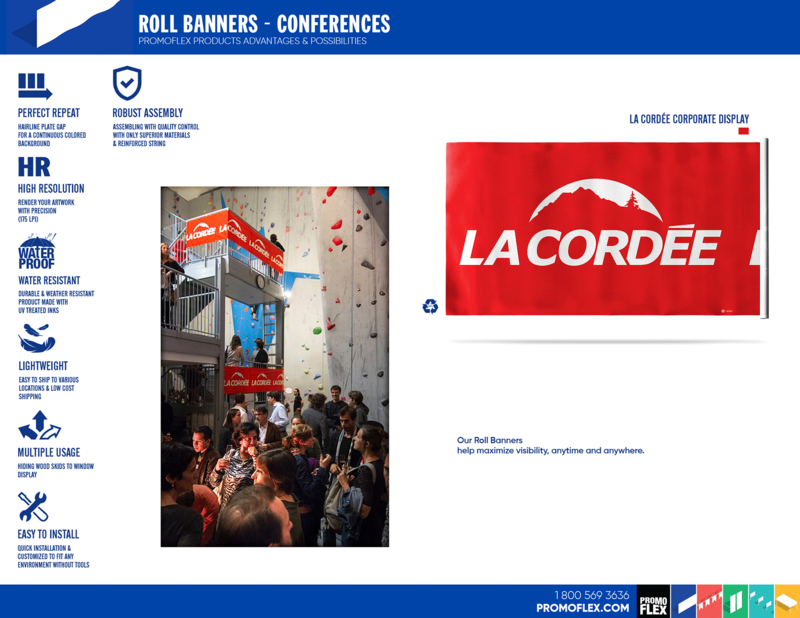 We can also transform all or some of your Roll Banners into a Suspended Banner product, to enhance your visual impact with stronger assembly and reusability for another event. 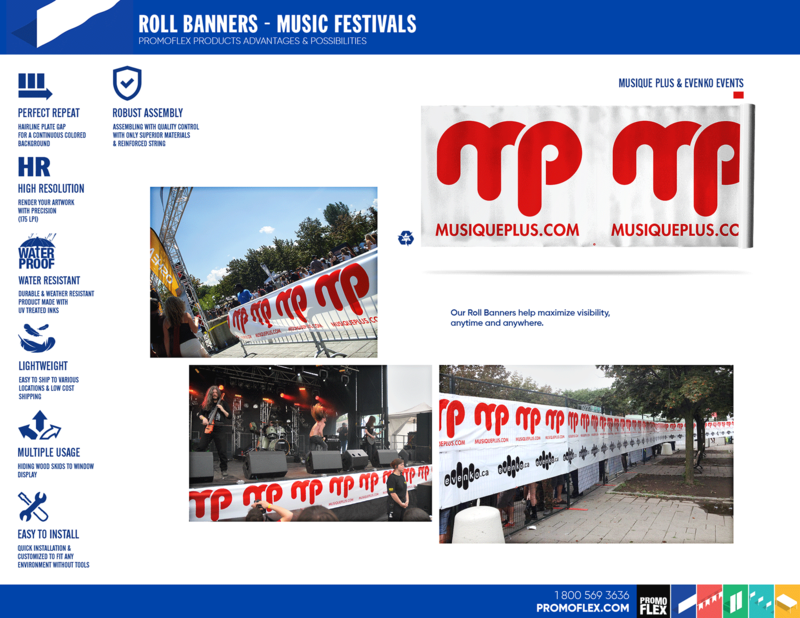 Roll Banners are available with all our material choices, for all budgets and three kinds of attachment solution kits.